I’ve teamed up with Lucy from Lucinda Photography to offer two great packages. I first met Lucy when I cast her second baby. I have used her personally for photography and I can’t recommend her enough. ...so why not take advantage of this luxury casting package. Book with both myself and Lucinda Newborn Photography and get some extra goodies. Lucy and I want to create a very special package for parents who would like to use both our services to capture the special moments in your baby’s first year. With this special Newborn Package you will ALSO receive a free 8 x 6 print from your professional gallery with Lucinda Photography to display in your casting frame and a free outprint hand or foot print plaque from Laura's Treasured Prints. 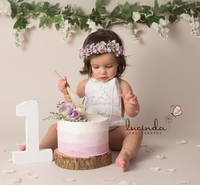 With this special Cake Smash and 12-18 month Cast package, you will ALSO receive a free 8 x 6 print from your professional gallery with Lucinda Photography to display in your casting frame and a free outprint hand or foot print plaque from Laura's Treasured Prints. A minimum spend of £150 towards products applies to all photo sessions with Lucinda Photography in addition to the session fee. Please discuss details with Lucy. Please inform both Lucy and Laura at the time of booking.